Unlike the (in)famous Swamp Buggy Races, tractor pulling has yet to be launched into the common consciousness by Wide Word of Sports et al. 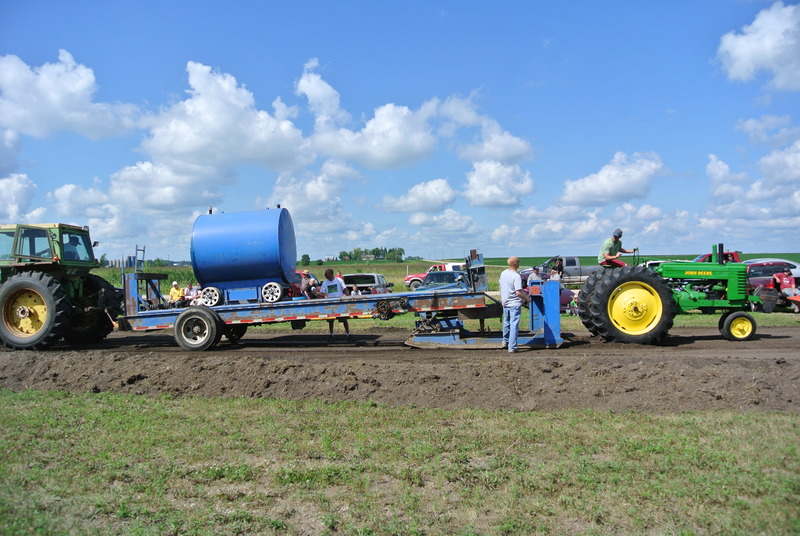 While most folks have heard of tractor pulling, few have actually seen tractor pulling, and in that absence of knowledge tractor pulling has been relegated to the same catagory of sports as fishing with ones forearms and such. 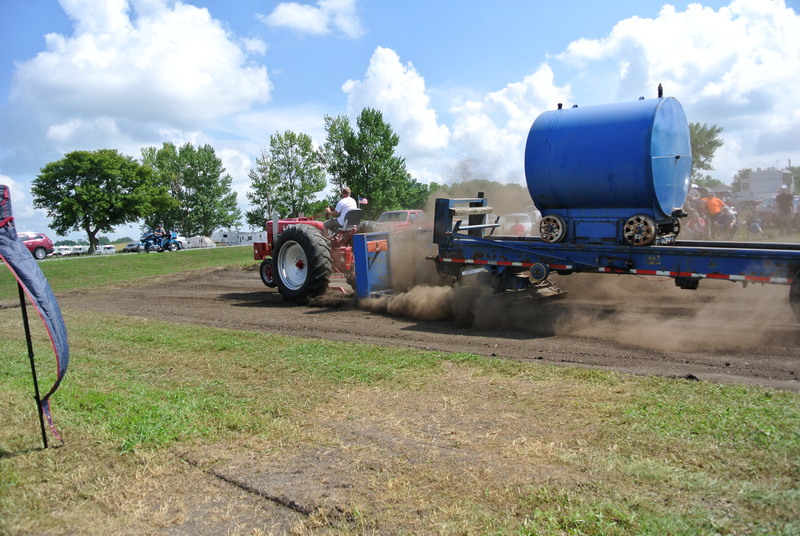 Tractor pullin’ ain’t nothin’ like that, in fact it’s a pretty sophisticated sport. 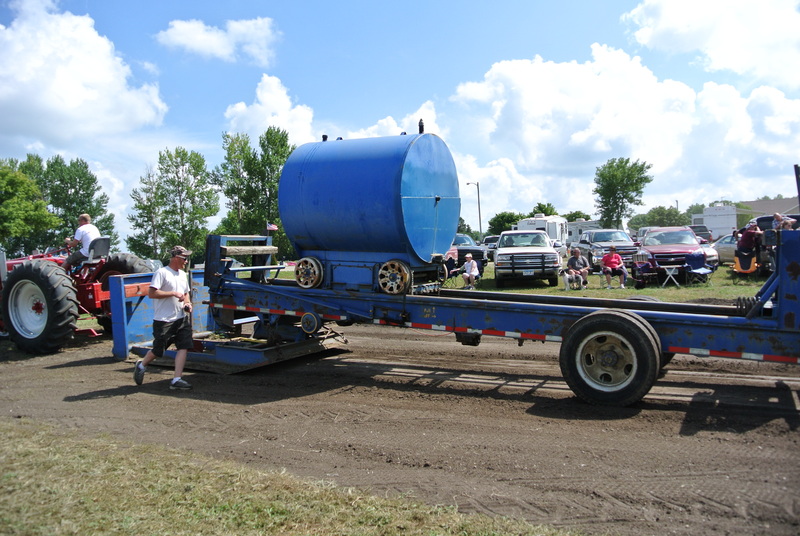 Tractor pulling 101… OK, we’ve got a tractor, but what’s this big old trailer thing hooked to it? 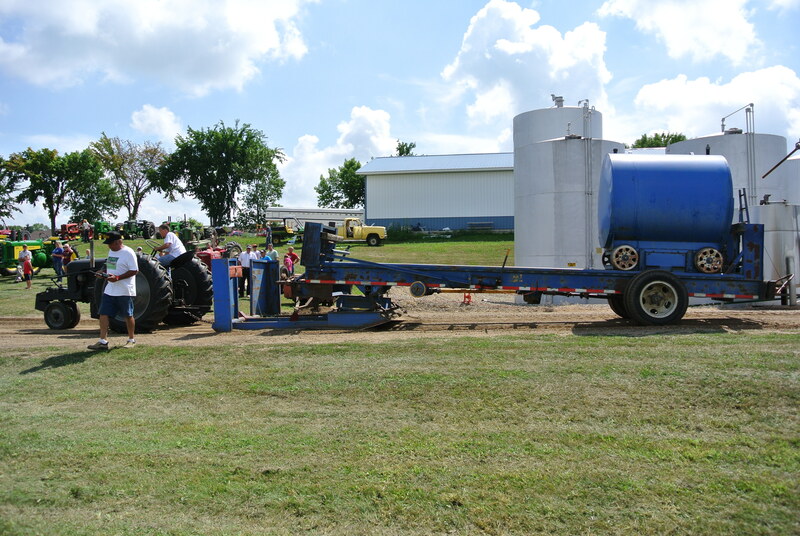 That’s called a “sled”, and it’s job is to simulate the load a tractor would see doing real tractor work like plowing or towing a loaded wagon. Under the front of the sled is a big flat plate that drags on the ground and creates a resistance to challenge the tractor. But no, it ain’t all that simple… Hmmm… Wasn’t that “tank on wheels” at the back of the sled? Yup, it was… But as the sled is pulled, the tank is pulled forward, it’s weight increasingly moving from the back wheels to that big old flat surface that’s such a drag on forward movement. Do a jackrabbit start or be anything less than smooth it gets worse, as that big ‘ol tank is moved even faster forward by jerkiness. And that tank ain’t empty, it’s essentially a “ballast box” whose weight can be varied to suit different sized tractors. BTW, this driver has made an excellent pull- he made it all the way to the end of the track and the ballast hadn’t even moved all the way forward. I saw a half dozen or so of these excellent runs that went the length of the track, all by very well driven relatively high powered tractors of medium weight. A modern 20 ton all wheel drive tractor would need a heavier sled to challenge it and could have dragged this sled clear across the state. A not so smooth pull- The ballast box is almost all the way forward putting near maximum weight on the dragging plate, while only making it a little over halfway up the track. The end of an excellent pull by a lower powered older tractor, again, smoothness is the key! This driver made it most of the way down the track, despite probably never exceeding 2 miles per hour. Not that the ballast has barely moved forward. 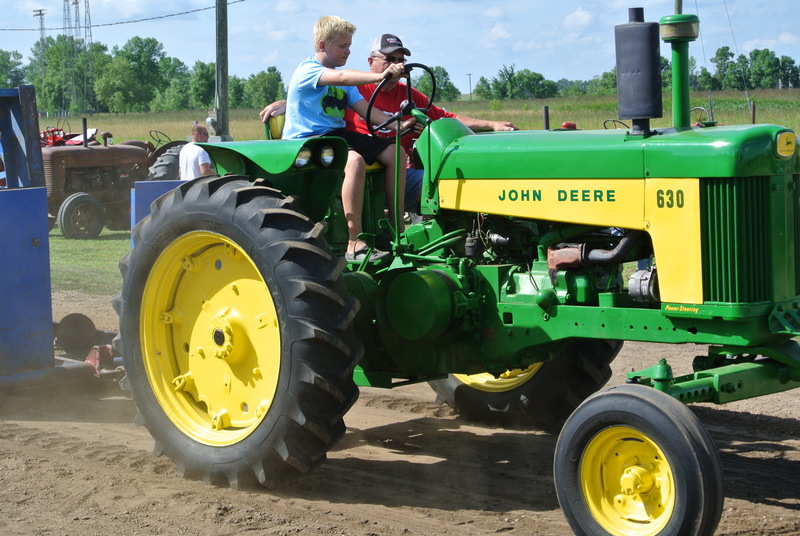 Driving these old tractors is a real challenge, definitely not “put it n gear and go”… There’s a clutch to keep the left foot busy, and individual rear wheel brakes to Keep the right foot busy, as drivers could be see lightly applying said brakes to stop wheelspin. Add a hand throttle and in some cases hand controls for ignition advance, and this is a real test of driving skill for every limb! A more dramatic pull… Note the dust cloud and the ballast has moved way forward. Highly modified pulling tractor, and I think there’s some Ford parts in their to go with the Ford colors and script on the hood. 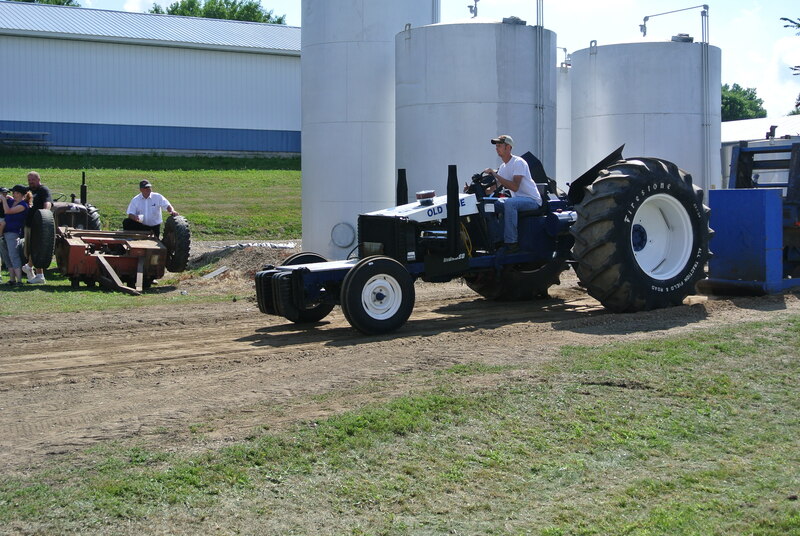 There were a handfull of these big block V-8 powered tractors pulling, and they could be a handful for their drivers. These were the tractors that made it to the end of the track and could have kept right on going, and the same tractors fizzled halfway there in a cloud of dust on their not so smooth runs. Either way, the audience loved the show! 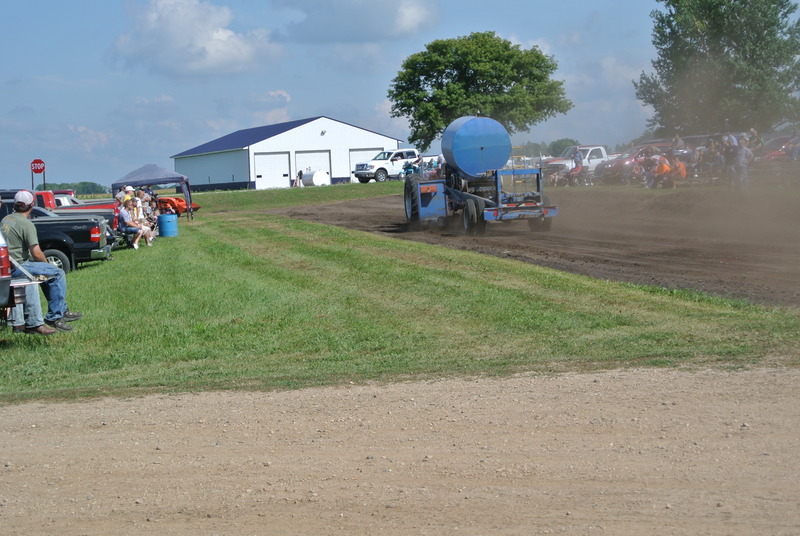 But the loudest applause was for the kids… Here a youngin’ under close adult supervision makes an excellent pull… Tractor pullin’ has a bright future ahead!